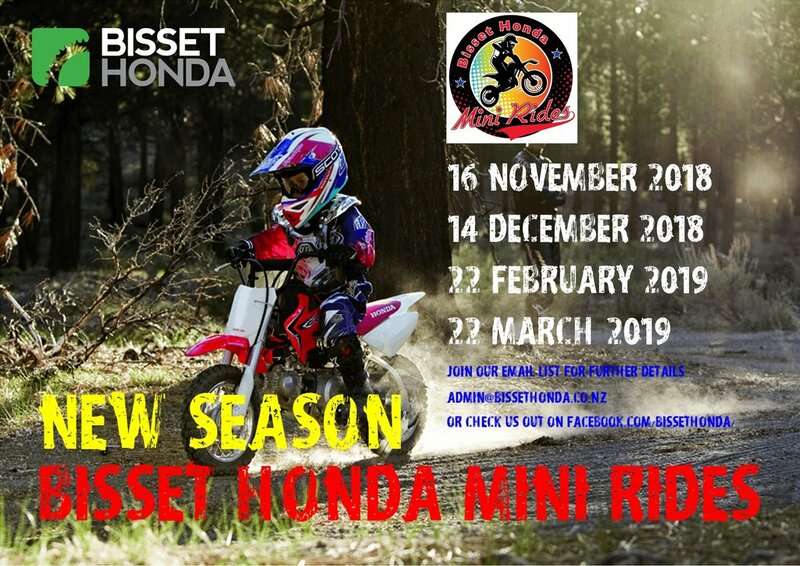 Classes: - Up to 80cc 2-stroke and up to 125cc 4-stroke. Venue: Rounds 1, 2 and 3 will be held at J D Cleghorn’s Property on Troup Road, Woodville. This will be signposted from State Highway 2 south of Woodville and State Highway 3 west of Woodville. The venue for Round 4 is TBC. TIME: Sign in will be from 5pm, riding starts at 6pm sharp. BIKES ELGIBLE TO RIDE: Up to 80cc 2-stroke and up to 125cc 4-stroke. Please no 85s or 150s. No kids quads either please. We will split the riders into 3 groups depending on how many riders there are of each bike size on the night, no classes as such. COST& Food: Only $10 per rider which includes a bottle of water, and a voucher for hot chips and an American hot dog from the food truck. Additional food can also be purchased from the food truck. SAFETY GEAR: All riders must wear a MINIMUM of mx boots, helmet and armour. We also strongly recommend MX trousers, a long sleeved top and gloves. Neck braces are optional. All helmets must be securely fastened and checked by parents at the start line. 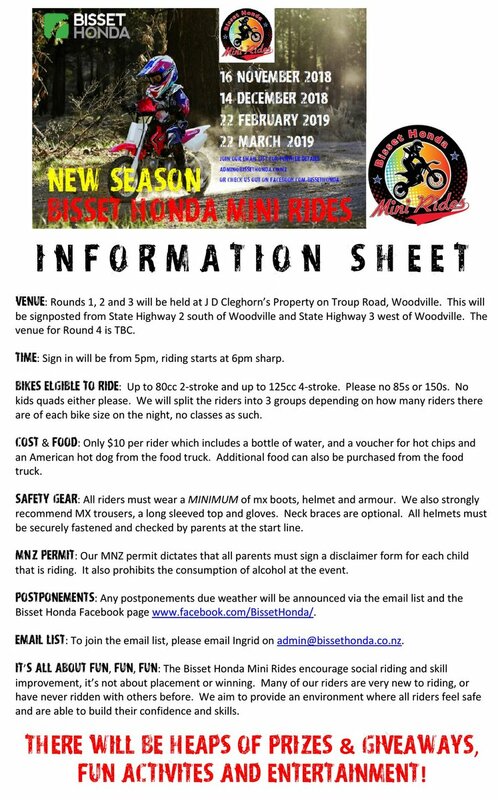 MNZ PERMIT: Our MNZ permit dictates that all parents must sign a disclaimer form for each child that is riding. It also prohibits the consumption of alcohol at the event. To keep up to date on all Mini Rides info, join our email list—just email Ingrid. Or you can phone Bevan or Ingrid on 06 376 8829 (work) or 027 465 9651.